This beautiful High Tide Exotic Mahogany Concert ukulele features an exotic mahogany top and body which produces a full, yet sharp and vibrant sound one can expect from a high-end concert ukulele. Ukulele enthusiasts will become infatuated with the rich exotic top and stunning multiply maple and walnut binding which showcases its overall natural beauty. 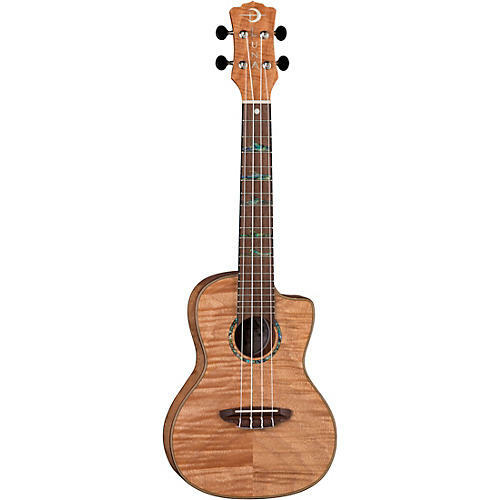 Luna’s High Tide Series is a premier line of line of ukuleles crafted from exotic tropical hardwoods. The idea behind the series takes its inspiration from the full moon at the first fret which causes the abalone wave fret markers below it to "rise" as they make their way up the fretboard towards the moon's pull. Each High Tide ukulele features a soundhole framed by an elegant abalone rosette. The sturdy mahogany neck, together with the walnut bridge and fretboard, provides lasting sustain and clarity to your tone.